We kind of like bread over here. Especially with our soup. Most people do. 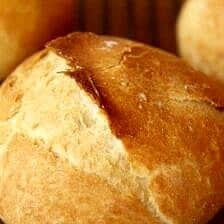 Crusty, flavorful bread hot out of the oven with a smear of butter or dunked in soup, creamy soup. 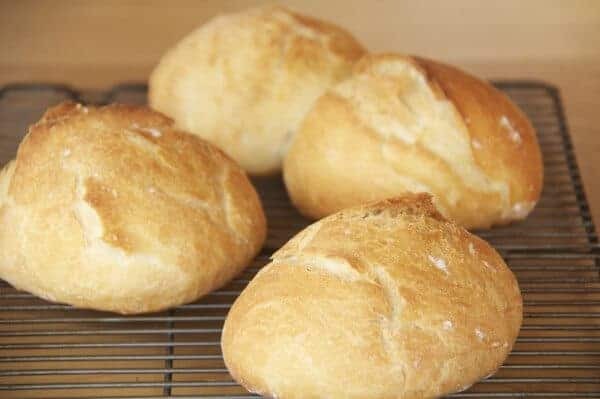 If you have never attempted to make your own bread then I urge you to start now! Nothing beats fresh homemade bread being passed around at the dinner table. 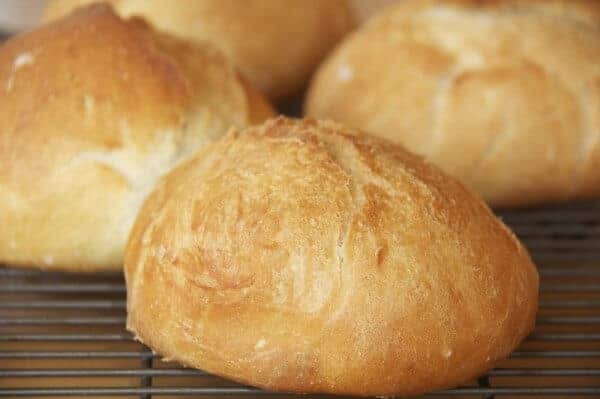 Everyone loves it and you will feel a sense of accomplishment when everyone is in awe that you could make such delicious bread. Trust me, you will get major points for this! Sourdough bread however takes some time. Nothing about it is difficult or time intensive though. You see, to achieve its sour flavor you will need something called a sourdough starter. This is basically just flour, water, yeast, and a little sugar. It needs sit at room temperature for 3 to 5 days to develop it’s flavor. After this it needs to be refrigerated. It can then be used to make any sourdough breads your heart desires. I have been looking for the prefect sourdough bread that, wait for it, is actually sour! There are two important factors to making this bread great! One is to give the dough proper time to develop its sour flavor. I know you might be anxious to eat it, but it will be worth the wait. DO NOT SKIP any of the resting and rising steps. Two is a dutch oven. Most people have one. Honestly, I bake all my bread inside my dutch oven with the lid on. It traps the heat and mimics that of a stone oven. It creates the most amazing crusty, holey bread! Seriously, if you do not have one you should probably think about investing in one. You will use it ALL the time, not just for bread. 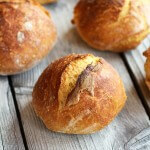 I shaped my bread into boules which can be used as a bowl or as personal loaves for dinner. The dough can also be shaped into two medium size loaves. 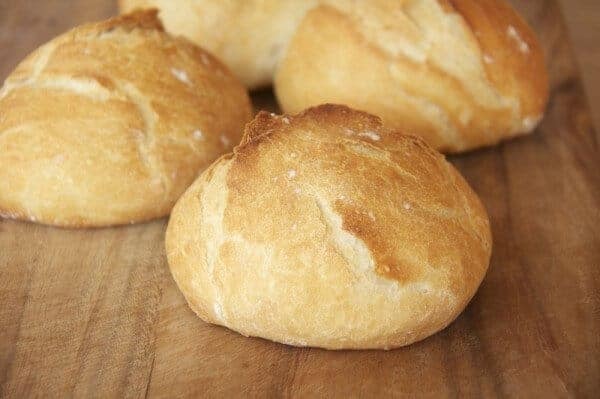 If you do not need to use all the bread it can be baked and then frozen or you can freeze the dough and then bake when needed. I froze half the dough and am excited to have it in the freezer for when the urge strikes! I do not think the family will eat soup out of anything else again! Like Panera, but BETTER! Pour the water into a 2-quart glass or ceramic jar or bowl. Stir in the sugar or honey to dissolve. Stir in the yeast. Let it develop 2-5 days, stirring once a day due to the separation that will occur. When bubbling has subsided and a sour aroma has developed, stir once more and refrigerate until ready to use. Once your starter is stored away in the refrigerator, it only needs to be replenished once every two weeks or so. I put a little note to myself in my calendar as a reminder to either bake with or feed my starter. You should feed your starter each time you remove a portion for use in baking, but if it has been two weeks and you don’t intend to bake with it immediately, simply remove a cup of the starter and discard. For every 1 cup of starter removed, replace with 1 cup of flour and ½ cup of water. Stir to blend, and let sit at room temperature for at least 12 hours before returning to the refrigerator. Freshly made sourdough bread bowls make for a tasty lunch or dinner! In a large mixing bowl or the bowl of an electric mixer, combine the starter, water, and all-purpose flour. Mix together with a fork or wooden spoon until smooth. Cover with plastic wrap and let sit at room temperature for 4 hours. Transfer the bowl to the refrigerator and chill overnight, at least 12 hours. Remove the bowl from the refrigerator and add the sugar, salt, and bread flour to the sponge. Mix until a ball of dough begins to come together. If some of the dry ingredients will not incorporate into the dough, add the additional 1 tablespoon of water to moisten them. 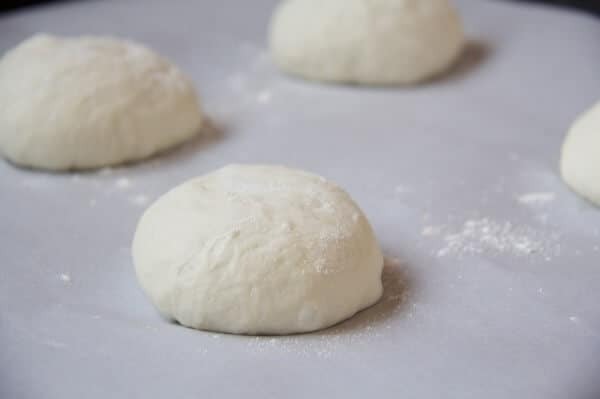 Continue kneading the dough (on low speed if using an electric mixer) until the dough is smooth and elastic, about 5-6 minutes. Form the dough into a ball and transfer to a large lightly oiled bowl, turning the dough once to coat in the oil. Cover with plastic wrap and let rise in a warm spot until doubled in volume, 3-4 hours. Line a baking sheet with a silicone baking mat or parchment paper. 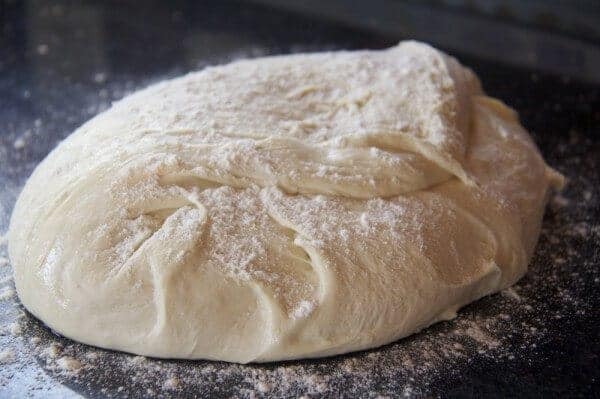 Transfer the dough ball to a lightly floured work surface and gently deflate the dough. Divide the dough into eight equal portions. Form each piece of dough into a ball, and tuck any loose edges or seams underneath. Place seam-side down on the prepared baking sheet. Repeat shaping with the other 7 pieces of the dough. Transfer the shaped boules to the prepared baking sheet. Cover loosely with lightly oiled plastic wrap. Let rise in a warm place until nearly doubled in volume, about 2-3 hours. Place a baking stone or large dutch oben in the oven and preheat the oven to 425? F. Allow the pot to preheat for at least 20 minutes. Just before baking, lightly slash the top of each boule using a sharp serrated knife. Brush the exposed surface of the loaves with the egg wash. Spray the loaves lightly with water. Slide the entire baking sheet onto the baking stone or carefully place 4 boules in the dutch oven with the top on. Bake about 28-32 minutes, rotating the pan halfway through baking, until the crust is golden brown. If baking with the dutch oven repeat once the first four have been baked. Transfer the finished boules to a wire rack and let cool at least 30 minutes before slicing and serving. *The dough can be shaped into two loaves. Once the dough is read to be shaped divide it into two equal portions. Working with one piece of the dough, press gently into a rough rectangular shape. Make an indentation along the length of the dough with an outstretched hand. Press the thumb of one hand along the indentation while pulling the upper edge of the dough down over the hand to enclose the thumb. Tightly roll the dough towards you while forming into a rough torpedo shape, about 6 x 8 inches. If there is a seam, pinch it shut. Place seam-side down on the prepared baking sheet. Repeat shaping with the other half of the dough. Transfer the shaped loaves to the prepared baking sheet. Cover loosely with lightly oiled plastic wrap. Let rise in a warm place until nearly doubled in volume, about 2-3 hours. Bake as directed. *Using a baking stone of dutch oven is what creates this amazing crust. If you have a dutch oven please use it! If not this bread can still be baked using a baking sheet. I am not sure how the crust will turn out. 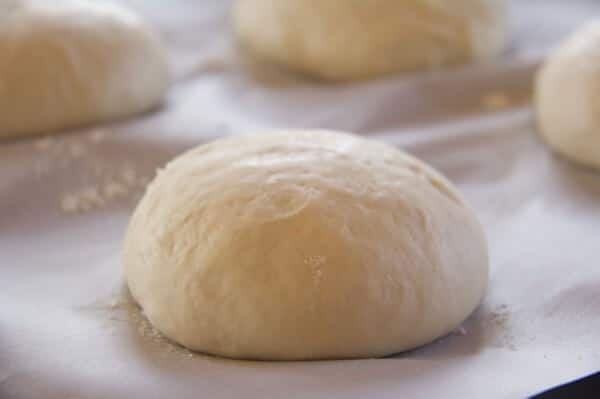 *To Freeze The Dough: Let dough complete all it risings. Shape into a ball and place in a freezer bag. Freeze. When ready to use defrost. When defrost shape into a loaf or boule and allow to rise until doubled in size. Bake as directed. To Freeze the Baked Bread: Allow the bread to cool completely wrap well and freeze. When ready to eat defrost on the counter for an hour or two. Reheat in a 350 degree oven until heated through. So about that soup…It is soo good. Can’t wait to tell you about it. I specialized in making challahs (Jewish bread) and I must say – these are beautiful breads! My sister used to make sourdough bread all the time, but then she moved out of state for college! 🙁 I will have to try this soon because I seriously miss eating sourdough bread! I found your post via Whipperberry! I’m definitely going to sign up for your site – you have great recipes! My plan is to work on my sourdough recipes in November. My sister gave me a wonderful ceramic dutch oven last Christmas which is dedicated to baking bread. I can’t wait to use it with your recipe. These look amazing! Can’t wait to try them!! These look so good! Thanks for sharing. The dutch oven really works like magic! I swear! Your bread is beautiful! I love baking bread, and I’m always looking for new recipes. 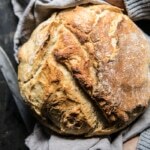 I have not used a Dutch oven before, but wow it makes your bread look amazing! The sourdough I have made had potato flakes in the starter, will try this recipe too. Thanks! The dutch over really works like magic! Let me know how it turns out! Oh thank you for this recipe. I have made sourdough but never made sourdough from scratch, that is, without a special starter i could purchase. i just gotta try your method of making it. Meanwhile, do come and share it at our linky party, at http://www.finecraftguild.com/party-3/ Our readers would love to find you. Thank you! I will! Let me know how it turns out! This is amazing! I LOVE sourdough and so does my daughter! I will definitely try this. Just wish I had started this 5 or 6 days ago so I could already be eating it! Thanks so much for linking up to Creative Thursday. Can’t wait to see what you share this week! Have a wonderful week. What size does the dutch oven need to be? I have one that I cook in that came with my pan set but it seems a little large. Does it need to be the size you want your finished bread to be? Like about only 10 inches? Also my lid has a black (Plastic?) handle on the top. Do you put that kind in the oven? Thanks for your help! It does not matter what size your dutch oven is aslong as the dough fits in it. As for the top cover it in a good layer of tin foil and it should be fine in the oven! Let me know how it turns out! I have been looking for a good sourdough starter for a while now. So excited to find this! Can’t wait to try it. Love soup and love bread, especially homemade! It really is so good! Let me know how it turns out! My husband is the bread baker in our family. He hasn’t made rolls in a while. I will pass this recipe on to him. Thanks for sharing it on foodie friday. Totally gorgeous! I love sourdough bread, and I like the time and effort it takes to make it. It is always rewarding. Thank you for sharing at Foodie Friends Friday. It really is so rewarding! I love when I get to see the finished product! These look great! Please come by and post on our blog party! Thank you! Please help spread the word! The hardest part about this recipe is actually starting the starter! I always say i am going to do it, but never do! Great recipes. Love sourdough! HAPPY THANKSGIVING! We’ll have a linky party tomorrow but the blog will be ‘closed for business’ on Thursday. That is: all the free Thanksgiving coloring pages etc. will be downloadable but I won’t be turning on that computer..,So, we hope to see you tomorrow then! Love sourdough bread and this looks irresistible. It’s almost an year since I started to make homemade sourdough bread and it is just amazing. I’ve made my sourdough starter from scratch using only flour and water, for 2 weeks. Since then I keep it in refrigerator and feed it once a week . There is no comparison with the yeast bread. Hi there, this is actually a good write-up. You get my vote for this and also I am going to bookmark your blog right now. These look amazing, I can’t wait to try them! I have my sponge resting on the counter right now 🙂 Question…how do you get the bread bowls in the Dutch oven without deflating them after they have risen? I very carefully place two at a time in the dutch ovens using my hands. The keyword is careful. If they deflate a little that ok! good luck! There is something about sourdough bread that I just LOVE. Have you ever heard about Sourdough International’s sourdough starter? I have a friend who bakes and she uses their starters but I kind of wanted some more reviews..
No I have never heard of that, but how cool!! I must try and find some! I am new to baking so I’m clueless!!! My friends have all recommended Sourdough’s International’s sourdough starter to me, so I’m going to give it a go!!! Thank you so much! That starter sounds awesome! I have trouble with keeping the bread in “bowl like” form while baking. They seem to flatten with time. Any suggestions? Hmm, this is really weird. I have never heard of the bowls not holding their shape. Are you sure they are cooked in the middle? The only thing I can think is that they are still doughy in the center, causing them to flatten as they sit. I would just like to make loaf sour dough bread. Can you tell me how to do that ? Hey Cathy! Instead of dividing the bread into bowls, just leave it as one whole round or oval loaf and bake as directed. You are going to need to bake the bread a little longer than if you were to make the bowls. Hope this helps and I hope you love the bread! Hi first time listener, first time caller, Hey, what is the difference between the “sponge” and the “dough”??? I’m guessing the sponge is the starter and the dough is what you are using to make the bread bowls. … I saw the recipes the other night searching the web, I started a starter yesterday (Wednesday) and hope to be doing the bread bowls Sunday. Hey Mike! Yes, that is correct. Hope you love the bread!! Please let me know if you have any questions. I am passionate about bread, I can not live without them, breakfast without bread is not breakfast. I loved the photos and the post. Humm, these look so delicious! =) Thanks for sharing. How big do the bowls end up being (approximately how many inches across and how tall)? After you scoop some of the bread out, how much soup would you say it holds? I am planning to use these for a main course with clam chowder and don’t want them to be too small. Thanks! They are about the size of a normal cereal, but will hold a little less do to the thicker walls. Sorry, I do not now the exact measurements. oops, meant to say a normal cereal bowl. Let me know if you have any other questions. Thanks! Nice bread pictures! i am getting hungry now. Is it necessary to refrigerat 12hours. Can you go ahead and loaves, raise then bake. The 12 hours in the fridge is important to help develop that sour flavor. Wow, what a huge bread. I am here in Brazil. Very good your content! This process is really efficient. Very good your content! This process is really efficient! I was thrilled with this content! Thanks. great images! An exciting article. Thanks! I had never imagined he would find such a good content! Thanks. You write very well! Thanks for content. I sensational content! Beautiful words. I really enjoyed your article! Happy Birthday. This article is perfect! Congratulations! I love homemade breads! Thanks for this recipe! Thanks! Hope you love the recipe! A sensational text! Thank you. Two questions: What kind of Dutch oven do you have — ceramic, cast iron, what? And, I like a VERY sour dough. Will your starter give this result? Any special trick to making it very sour? Thank you! Oops, one more — does rainy, humid weather have any effect on making the starter, or the bread itself? Thanks again. HI! I have a cast iron dutch oven. unfortunately, I am not a bread making pro, so no major tips for you on making it very sour. That said, I think the bread is pretty sour as is. I have not noticed a difference in humid weather or anything like that. Thanks! Wow! This looks delicious. Making this tomorrow! It’s amazing how some people have the quality of writing! Happy Birthday. Congratulations on compartilher these incredible information. Hi, I am bread fan and it looks delicious. I was looking for some food receipe and find yours. Thanks for it! Thank you so much! Hope you love the bread! Hi! Thanks for sharing this great post! It should be delicious, following your blog. I learned a lot with its contents. My heartfelt thanks. How wonderful it is to know a conteúde of such quality. I did not know you could learn so much in one place. Thanks. Ow, great article. Thanks! The Best! I tried yesterday and got a terrific result. When it comes to copy your content fits, for fine detailed reports as required by the User, congratulations. Very good, like your friend blog! There, I got the recipe will prepare then I come here to tell as it got ! Amazing bread! Thank you for share! I’m up with your mouth water with this recipe. 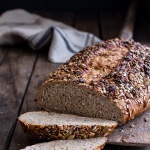 I love these type of breads, thank you for the recipe in this page! It will help me so much! Wow, this looks amazing! Can’t wait to try it. 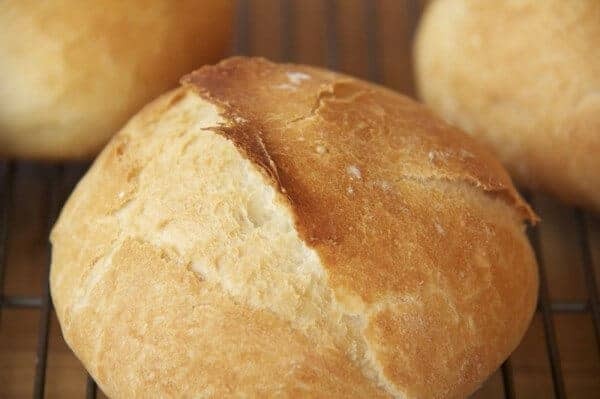 Hummm amo pão, este então parece maravilhoso…. I loved your site for the first time I come here I already want to return again, congratulations for the tips I love make bread and cake. Wonderful blog and your revenues then it is worth came here to seek information. NOssa muitas receitas de deixar qualquer um com muita fome…obrigado pelas dicas. Muito obrigado! Feliz Cinco de Mayo!! Thanks!! So happy you liked it!! I love sourdough bread so I decided to give it a try on doing homemade sourdough. Is the starter supposed to separate the liquid from the rest when it sits on the counter for days? I know it’s supposed to smell sour but does that mean sour as in what sourdough bread smells like? Mine smells more like rancid. I made it on Tuesday and it is now Thursday. HI Sasha! It is really hard to say without seeing your starter. Mind does not separate, so I wander if it could have been too warm in your kitchen possibly? It smell sour, but not bad. Let me know if I can help more, sorry! this is good for life salud..
Nossa essa receita é uma delícia. eu mesmo estou com água na boca.. Valeu..
Tão feliz que você gosta , obrigado !! My goodness, I have already noted the recipe, I want to try to make it here at home. Yes! I hope you do!! Let me know what you think!! Thanks!! Parabéns, isso deve ser muito saboroso. this is good for life salud.. muito bom! Hmmm … It looks good. Thanks Bianca! I think you got this!! I loved its revenues to continue posting’ll come here whenever you can to learn from you thank you ..
great information and I love your recipes. Congratulations. I never saw a very good site like this is speechless. Maravilhosas suas receitas gostei muito vou voltar sempre aqui procurando novidades continue compartilhando. Adorei suas receitas pela primeira vez que venho aqui já me considero sua fã obrigada por postar esse maravilhoso conteúdo.. Improvement is a good content for your website, where I travel I always take good tips. Muito bom o artigo, essa metodologia de trabalho poderia ser bem mais em conta com uma boa estrategia de marketing, você esta mantendo um bom conteúdo. This looks like a wonderful recipe. I am looking for a new sourdough bread bowl recipe, as the first one I tried did not rise as bowls, leaving me with wonderful tasting nearly flat bread — which was not my full intention. Although I like the taste of the first product, I will try yours from the starter, as I don’t know where the issue lies. One suggestion though, as you say you do not know how the crust will turn out outside of the dutch oven. The previous recipe mentioned, called for steaming the oiled bread bowls, which I assumed gave them the crunchy outer layer necessary for a bread bowl. If you care to try it: It calls for placing a pan at the bottom of the oven before putting the bread in. Prepare a cup filled with ice and water. Put the bread in the oven and as quickly as possible, as to not lose temperature, dump the ice water in the pan and shut the oven. In 5 minutes, repeat, and resume cooking as directed. Not exactly as beautiful as your dutch oven pictures, but I was pleased with the crunchy, yet chewy texture, and hard enough to hold in liquids. I can’t wait to dig into your recipe, and I hope it solves my problem of the boules not retaining the bowl shape! Thank you so much. Your directions are amazing!!! Thanks Kathy! Let me know if you have any questions, hope you love the recipe! great content. Congratulations. Very good! I try today! Thank you. Congratulations loved your recipe I love making homemade bread .. Thanks so much! I am so happy you enjoyed this one Andreza! It’s almost an year since I started to make homemade sourdough bread and it is just amazing. I’ve made my sourdough starter from scratch using only flour and water, for 2 weeks. Thats awesome! I am so happy you love it! I love baking bread, and I’m always looking for new recipes. I have not used a Dutch oven before, but wow it makes your bread look amazing! Haha thank you Roberto!! I hope you get a chance to try this! Thanks for the article loved your revenue ..
Parabéns pelo excelente conteúdo, receitas maravilhosas, gostei muito. That is so great to hear, I am really happy you love it! Thanks so much! I love your site the first time I’ve been here since I will become fan .. WOO!! Happy you’re loving it Neide!! Thank you! Their recipes are wonderful loved your blog congratulations .. I like that bread recipe I love sloshed sloshed bread, thank you for sharing .. Awesome!! So happy it was great! Thanks Rosa! Thanks HALF BAKED HARVEST, for these wonderful recipe .. Thank you! I am happy you are enjoying them! Please help. I followed the steps for days and when I was ready to bake my bread it was wet looking compared to your photos after rising under the plastic. It has not risen up into the bowl shape I had hoped for but was much more like a puff disk. Where did I go wrong? How can I fix this for the next batch? TOP 10 your blog, liked the recipes I was researching about it when I got here was worth it thanks .. I love bread and I loved this post. Thank you! Thanks so much Guia! I hope you enjoy this! I love bread, I’ll try to make this recipe here at home. Awesome! I hope you love it Michael, thanks! I WILL DO AND TEST THIS RECIPE IN MY HOME. Perfect! I hope it goes great for you! So happy they were successful! Thank you!! Great recipe. To savor with a soup then it should look wonderful. Thank you!! Hope you love it!! Our great, post I liked a lot, and I will share with my facebook friends. It reminds me of the days of a child when my grandmother made countries like this. YAY! So happy you like them! Thank you! I loved your article, there are many tips I can follow. It’s a beautiful recipe, I’m crazy to try it. Thank you for teaching me how to make this delicious. Your welcome!! Hope you love it! Your site is wonderful, I feel the feeling of being in a very serious site and that it passes good things for us readers, thank you for sharing this site with us. Thanks so much, so happy you like it! Cold day today. Nothing like a soup with good bread. I’ll try it today! Hope you loved it Adriano! Thank you! Estou tão feliz que você está gostando desta receita! Obrigado Jéssica! Me too! I hope you love this bread bowl! Thank you!! 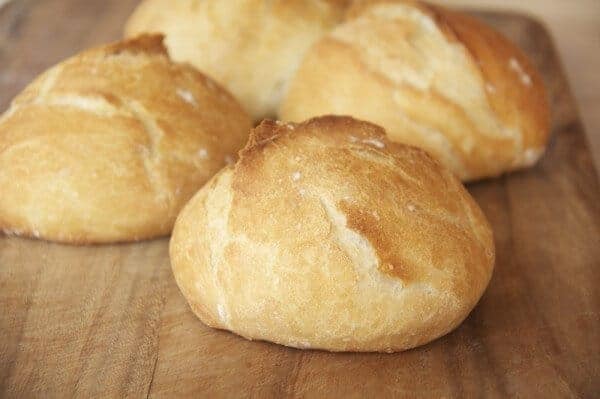 Thank you very much for sharing this wonderful and delicious bread recipe with us, I made it here at home and it went very well, it was a delight. I am so glad it went perfect for you! Thank you! This is really great, thanks for the tip. This subject is very interesting. Your information is accurate. I was very helpful. We always need accurate information. So we can do quality work by spending as little as possible. Thank you. My article will add value in your life, thanks for this. Very good, I loved it, thank you! So happy you liked it thank you! I love homemade bread, thanks for sharing. Perfect, very good recipe. Thank you for sharing! I am so glad you enjoyed it Allane! Thank you! I hope it turns out awesome Julio! Thank you! Bread with soup is so good, great idea, nham!!! I found your post incredible, I already wrote down the recipe I’ll prepare here, and then I’ll tell you how it came out. Wow thank you! I hope you love it! Hi Tieghan, congratulations for the content! Your blog is amazing, and thanks for share the reciple, I’ll try make it. Thank you Diana! I hope you love the bread bowls! I really enjoyed the recipe. I really like cooking. Thank you! Same here, haha! I also am in love with bread! Thanks so much Vence! Hello Annie. Thanks for sharing this wonderful recipe. Ok, very nice job! Congrats! It must be very tasty. I liked your site revenues of delights. thank you for sharing. I am happy you do, thanks!! Many thanks for the bread and soup recipe, very easy to make and delicious to eat, thanks for sharing with us. Happy to hear that you liked this! Thanks! 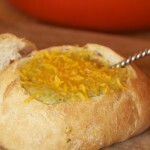 I loved the Sourdough Bread Bowls recipe, sure to do at home. Thank you! I liked the article! Thank you! Método Bumbum Na Nuca Thank you for sharing with us, its amazing! So happy you like it, your welcome! Fazer pão é uma arte que poucos dominam. I totally get it the latest post here thank you so much for this post. I loved the recipe. Thanks for sharing. But this one, deserves a chance!! I think you can make it, its not too hard I promise!! I hope you guys love it! Thank you! Wow! So cool to hear from you Eliane! Thank you so much! Wow wonderful. It must be very tasty. Great! Thank you very much.This documentation is amazing. What delicious recipe, congratulations, I really enjoyed it. I like passion breads mouth watering your your recipe thank you. It seems to be very tasty, it’s mouth watering. Great article, I really liked this site, I will always come back! Haha glad to hear it! Thank you! Wonderful recipe for this loaf, I loved it and will recommend it. Muito bom gostei muito, era o que eu estava procurando. Muito obrigado! Estou muito feliz por você ter gostado disso! Delicious recipe…thank you for share!! Amei tudo que encontrei aqui pela primeira vez que vim aqui já me apaixonei adoro pão caseiro obrigado por compartilhar esta delicias conosco..
Obrigado! Estou tão feliz que você aproveite minhas receitas e espero que continue! It looks delicious. I will surely try this. Thank you very much for sharing this wonderful recipe, I do not know what would be of me without this blog, ours as it helps me with the recipes. I confess that I am completely crazy about the recipes of this wonderful and lovely blog. Great recipe, I liked it too much to know, I was mouthwatering just to see the image, when preparing here will be a party. Congratulations on the recipes you share. I am so glad you like this! Thanks! Thank you! I am really glad you do! Nossa que delicia da água na boca só de ver as imagens. Parabéns pelo post! Muito obrigado! Estou tão feliz que você gostou desta receita! OURSELF THAT DELICIATION WILL I BE ABLE TO DO? I found these slices of bread very healthy for a normal human being would you wanted to see such a latest bread bowls here. I absolutely love your cookbook and your recipes have become a staple in my house, and have made me a much better and more adventurous cook! I am definitely not a baker and have never made bread, so I decided to start wih something easy (lol)like a sourdough starter this morning. Added everything into a 1700ml glass jar (I used dry active yeast), covered it, and within about a half hour it had absolutely exploded and overflowed all over my counter. What did I do wrong? My water was pretty warm, could that be it? It continues to grow and bubble. Is it still usable? Thanks! Muito bom o artigo, bem completo!!! Wow! very good this recipe. I loved it!